"I set this down as a fact, that if all men knew what each said of the other, there would not be four friends in the world." (Quoted in "Do Your Friendships Live Out the Gospel?" by Jonathan Holmes in the newest issue of the Journal of Biblical Counseling. 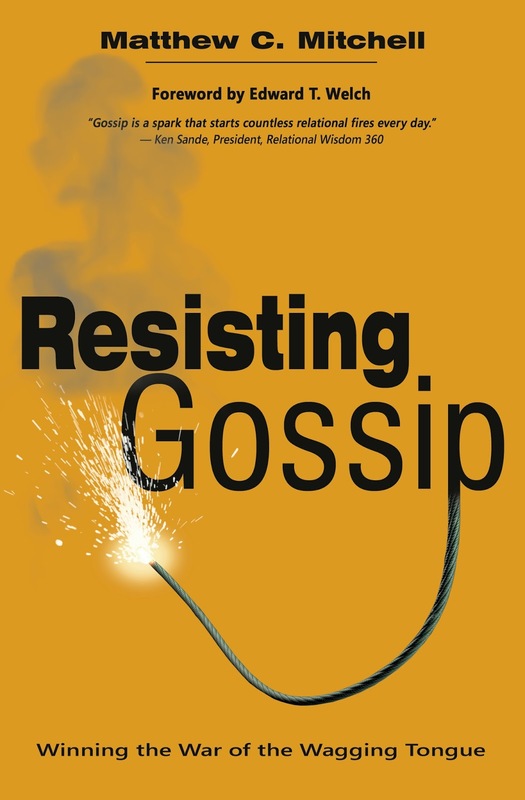 Holmes says, "Though gossip and slander can (and should) be forgiven like any other sin, it can take considerable time for trust to be rebuilt, and the hard truth is that many friendships never recover fully" (pg.37)). [Matt's Messages] "The LORD Is Still God." This is Back 2 School Sunday, and it seemed appropriate to me for us to go BACK to 1 Kings. Back to 1 Kings on Back 2 School Sunday. Does anybody remember what was going on 1 Kings? Well, we’ve met a lot of kings so far. In fact, we’ve met 13 different kings. David, Solomon, Rehoboam, Jeroboam, Abijah, Asa, Nadab, Baasha, Elah, Zimri, Tibni (if you count him), Omri, and last and worst so far, Ahab. Do you remember all of those guys? A few of those kings were thumbs up guys, at least for part of their life. But most of them were two thumbs down in the eyes of the LORD. Especially this last one, King Ahab. This guy was worse than everybody before him. The author says that he “considered it trivial to commit the sins of Jeroboam son of Nebat.” So he married the wicked queen Jezebel and began to serve and worship Baal. He was the worst so far. Six thumbs down. And it was during his reign that we began to hear another story being told. A story about a prophet named Elijah. The days of Ahab turned out to be the days of Elijah. Like we sang this morning. Elijah had a tough job–to prophesy during the reign of Ahab and Jezebel. Jezebel especially hated the prophets of Yahweh and wanted them all dead. So Elijah spent a lot of his ministry on the run. Hiding out from Jezebel’s hitmen. But he didn’t hide all of the time. He also confronted the prophets of Baal. First, he showed up one day and announced that it wouldn’t rain again until he said it would. Remember that? And they went more than 3 years without rain. That’s because Baal was supposed to be the god of the storm. But the LORD, Yahweh, had turned off the faucet. And then one day when the cattle dying, Elijah shows back up and calls for a contest to see whose god is real. Whose god lives. Whose god is really God. Remember this? They have a contest up on Mount Carmel. 450 prophets to 1. And they are still no match. Because the Baal isn’t real. He doesn’t answer. He isn’t powerful. He is not God. Do you remember what all of the people of Israel yell after the fire came from heaven and sucked up all of the water and the sacrifice and even the altar? And Elijah, empowered by the LORD runs faster than Ahab’s chariot all the way to Jezreel. That’s where left off last time. Here’s the title of today’s message. Even when we feel alone. Even when we are discouraged. Even when we are weary. Even when it feels like nothing ever works. The LORD is still God. That’s the point of today’s message. My guess is that some of us really need to hear it. Because in chapter 19, Elijah–who has just won the biggest showdown of the prophets since Moses versus the Magicians of Egypt–Elijah is going to be significantly disappointed. He has just won. Yahweh has sent the fire. Baal has been discredited, dishonored, and disgraced. The prophets of Baal have been put to the sword. The people are shouting, “Yahweh is God.” And Elijah has run with supernatural speed to confront Jezebel. It’s even possible that now that Ahab has seen the power of the LORD with his own eyes, that he will repent and lead Israel to return to Yahweh. National revival may be on the way! But none of that happens. That’s not how it turns out. In fact, it looks like all of this was for nothing. Let’s read. Chapter 19, verse 1. Wow. That’s a big change, isn’t it? From running full tilt towards Jezebel in victory to running full tilt away from Jezebel in what felt like defeat? That’s a big change in a very short amount of time. Have you ever felt like Elijah? This guy was depressed. He was despondent. He was heartsick. He was despairing. It seemed like it hadn’t worked. All that stuff he’d been doing for the last how many years, and it didn’t change anything! Ahab didn’t repent. He tattled. He didn’t tell Jezebel that Yahweh was God, and they were now going to follow Him. He said just told her what happened and then let her do whatever she wanted. And what she wanted was to go after Elijah. There was no national revival. The official religion of the royalty of Israel was still Baalism! In the NIV, verse 3 says that Elijah was afraid, and it seems like he had good reason to be. But the footnote says that the Hebrew could be translated, “Elijah saw.” I think that’s probably more likely. Elijah saw the way things were and what was going to happen next. And it was almost devastating to him. He leaves his servant at Beersheba, I think that means he doesn’t expect to come back. And he finds a broom tree which is as desolate as it sounds and plops down and tells God that he’s ready to die. He doesn’t want Jezebel to take to his life. He doesn’t want her to win. But he’s just played out. He doesn’t have anything left. It feels like the game is over, and he’s lost it. Probably some of you are basically feeling that way today. I’m not sitting blessed under my vine and my fig tree (4:25). I’m sitting depressed under a broom tree in the desert. And I just want to curl up and die. When things are going great for other Christians. Last week, we had a tremendous Good News Cruise. We prayed for it all Summer and did all of that work and we had a great turnout. And a little bit of rain. And so many affirmations from people that we had done a good job. That felt good. God is good! Amen? What if it had rained all day long? What if nobody had come? What if all of those hotdogs and chips that Art had been stockpiling went bad and uneaten? What if there had been an accident and somebody’s car got totaled in our parking lot? There is no promise in Scripture that those things would not happen at our Good News Cruise. And if they did, would the LORD still be God? I’ve been the pastor here for 18 years, and they’ve all been good years. Some harder than others. Some have been more fruitful. But we’ve never seen great revival. Never seen an amazing spiritual awakening in our community. And we’ve not seen national revival though we’ve prayed for it many times. It’s easy to get discouraged. It’s times like that when we need to be reminded that LORD is still God. Not just in the exciting times when we’re winning. But after that when it doesn’t seem like anything has changed. Four points this morning. Here’s number one. I love that. God is so good to Elijah. He’s so gentle and generous. Elijah wants to die, but God gives him sleep, something warm to eat, something cool to drink, and an angel to deliver it. These may not be the things that Elijah wanted, but they were just what the doctor ordered. They were what Elijah really needed. And He’s always giving little gentle gifts to us even when things are at their worst. Last week, Dan Kerlin’s brother was in that bad accident. I texted him to find out how Murph was doing. He replied, “Pretty much the same, induced coma, brain bleed drain has been removed, lots of movement, still on vent. God is working in this situation. He’s still good. Even in the worst of times, He’s still looking out for us and giving us little, gentle gifts of His grace. Now, if you’ve read your Bible for a while, all kinds of bells and whistles should be going off in your head right now. Forty days and forty nights? Remind you of anybody? Moses on Mount Sinai? What’s the other name for Mount Sinai? Mount Horeb. This is the place where God made the covenant with His people. This is the place where they broke the covenant, and then He made it again. And maybe there is a little bit of a rebuke there, but I don’t think much. Why is Elijah here? Because God told to him come here. V.7 indicates that, right? Elijah wanted to die in the desert. The LORD wanted him to eat up to take a forty day journey to Horeb. It’s an invitation to trust Him. That’s a possible interpretation of this verse (and verse 14). And I think there is an element of complaint here. And some exaggeration. Elijah knows that his friend Obadiah has hidden 100 prophets in Israeli caves. He might be the only one who was public, but there were others. But I think he’s mainly just pouring out his lament to the LORD. Lord, it’s all falling apart! I do love you, LORD. I’ve been very zealous. You know I have. I’ve given my life to this work. But it hasn’t been working. Elijah is not just depressed for Himself. He hates what has happened to the name of the LORD. The Israelites have rejected the covenant. They have broken down the true altars and erected them to Baal. They have put the true prophets to death and elevated their own. This is not the way things ought to be! #2. HE IS STILL SPEAKING. I’m not sure all of the reasons why God puts on this fireworks display for Elijah. I don’t think it’s to scare him or shame him. But it is probably to remind Elijah that God is still powerful. He’s the same God who burned up that sacrifice yesterday. And He’s the same God that set this whole mountain on fire when He gave the 10 commandments to Moses. But more important than the demonstration of power is the still small voice of God. He’s not just like Baal the storm god. All flash and thunder supposedly but nobody really home. And He’s still speaking today. What’s He saying to you? “I’m here because I belong to you. I’m here because I love you. I’m here because of your name. I’m here because things aren’t working the way I thought they would. I’m here because you have me here. I’m tired. It hurts. And I feel alone. It’s possible that he’s whining. It’s possible that he didn’t learn anything from all of this. It’s possible that God is rebuking Elijah by asking him the same question a second time. But that’s not how it feels to me when I read it today. It doesn’t feel like an accusation. It feels like an invitation. And see what God does next? You know what that feels like to me? #3. HE IS STILL WORKING. The LORD is still at work. And He’s got more work for Elijah to do. Now, we’ll find out that Elijah doesn’t have a lot more to do. He’s coming to the end of his fantastic ministry. But God still has a job for him–anointing. Anointing two kings and a new prophet. Hazael over Aram. And he’s going to rain down judgment on Israel. And Jehu to be the next king of Israel. And he’s going to rain down judgment on Baalism. And Elisha to come alongside Elijah so he isn’t so lonely and so that someone else can take up and keep the work going. #4. HE IS STILL FAITHFUL. I love verse 18. Because Paul quotes it in Romans chapter 11. Remember that? Even if the nation goes down in flames and exile. God always keeps His promises and always preserves a remnant for Himself. Because He is still faithful. And that calls for us to trust Him. God has promised to save all of who will trust in Jesus. Jesus died and rose again to save sinners like you and me. And God promises to save us if we will turn from our sins and put our faith in Jesus and Him alone. The LORD is faithful, and He will do it. Trust Him. And follow Him by faith. That’s what Elijah does. He gets up right from there and goes right back to work. I’m not saying that he doesn’t still hurt. I’m sure he does. None of this erases the pain. But He’s heard from God. God is still working and still has a job for him, and God is faithful. So Elijah goes back to seeking His kingdom. That’s burning your bridges right there. Or burning your beef, at least. How do you burn your bridges like that? How do you give up everything and throw a feast then follow, follow, follow? 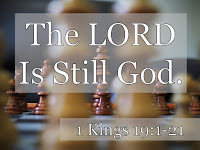 You believe that the LORD is still God. And that He’s still keeping every one of His promises. Here’s the message for all of our students, all of their parents, and everybody else who is headed back to school. No matter how it feels. No matter whether this school year goes like you want it to or if it just flops. The LORD is still good, He is still speaking, He is still working, and He is still faithful. 1. Remind each other of the story so far. Who was Elijah and what was his mission? What do you think Elijah might have expected to happen after the events of chapter 18? 2. Read 1 Kings 19:1-5. Why do you think Elijah was so discouraged? 3. Read 1 Kings 19:6-9. How does the LORD minister to Elijah in his time of testing? 4. Read 1 Kings 19:10-14. Do you think Elijah is whining? Why or why not? If he’s not whining, he is certainly expressing his lament with the LORD. As Christians, we often don’t understand the language of lament, but it is godly way of expressing our tear-filled pain to the Lord. Where else in the Bible can believers learn to lament? What have you learned about lament that helps you to understand Elijah’s prayers in verse 10 and verse 14? 5. 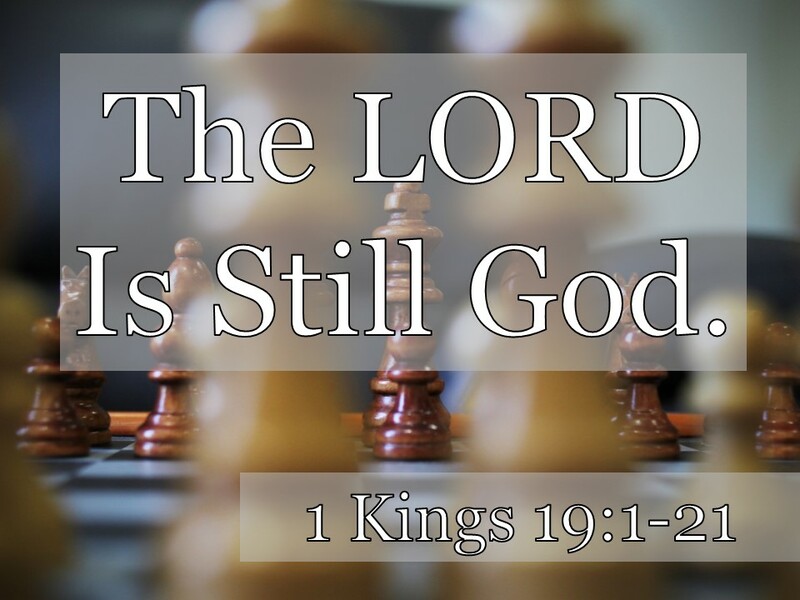 Read 1 Kings 19:15-21 and review Pastor Matt’s 4 points about how the LORD is still God. How does each point come from the story? 6. Did you need this story today? Why? When have you felt the kind of discouragement that Elijah felt? What helps you when you feel that way? How should we apply 1 Kings 19 to our lives today? [Matt's Messages] "Ready to Answer?" We will return to the Days of Elijah in 1 Kings next time I get up here to preach. But today, I want to help us get ourselves ready for the Good News Cruise. We’re working hard to get all of the details together. We need your help. Water bottles, gift bags, door prizes, cooler, canopies, set-up, parking, food service. All of that. All hands on deck! We need to get all of that ready for this big event. But even more important than all of that, we need to get ourselves ready spiritually. Because, you may have noticed, we’ve put an invitation on your back. Everybody see the back of the t-shirts this year? They are really cool. 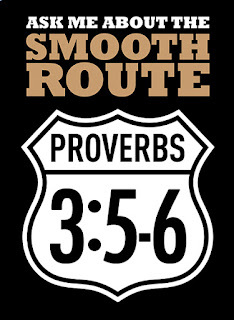 They have our theme verse reference for our Hide the Word verse, Proverbs 3:5-6. So, if they ask, what are you going to say? 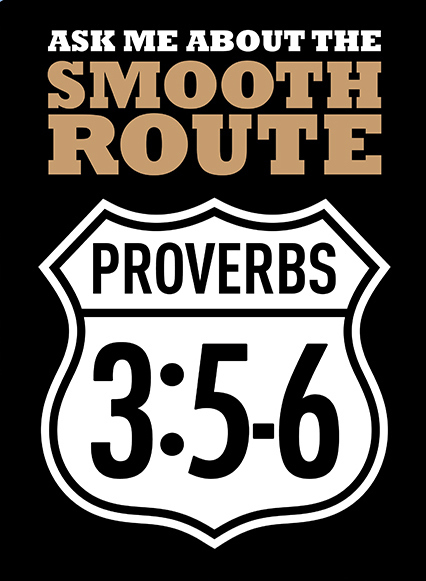 If someone says to you on Saturday, “So what’s this ‘Smooth Route’ all about?” what are you going to say? If you are a Christian, if you have been marked out as one of Jesus’ followers, then you need to be ready to talk about Him whether you wear a t-shirt or not. That’s what baptism is. It’s like putting on the t-shirt and going out in public. That’s what Peter is talking about in chapter 3 of his first letter. He’s writing to Christ-followers who are being persecuted for their faith. They are doing good and being good, but they are suffering for it. They are getting a raw deal. By the way, that’s one thing we do NOT mean by the “smooth route.” We do not mean that if you trust in Jesus then your life will run smoothly all of the time. No bumps, no roadblocks, not detours. Is that what Jesus promised us? No way. Jesus promised us, “In this world you will have...what?” Trouble! But take heart, Jesus has overcome the world. That’s what it means by saying, “He will make your paths straight.” He will direct your paths, and you will get home safely. We will safely reach our destination by faith. That’s the smooth route. Not that it won’t be painful at times. These Christians were experiencing the painful times. And Peter was encouraging them to hold on and to keep doing what was right even when they weren’t seeing the blessings yet in return. And in the middle of this kind of teaching, Peter tells his readers to always be ready to answer questions about their hope in God. In this passage, I see at least 3 ways that we need to get ready spiritually for the Good News Cruise. #1. READY YOUR HEART. Look at verse 15. You won’t be ready to talk about Jesus if your heart isn’t right with Jesus. In the context, Peter is telling the believers to not live in fear of other people, but instead to set apart Christ as Lord. Do you need to hear that? I need to hear that. Especially when I’m going into a possible evangelistic encounter. A potential gospel-sharing moment. What I am I thinking about? I’m worried (afraid) of what someone is going to say to me, do to me, or (gasp!) think about me! Worship Him at the heart level. The fear of the Lord is the beginning of wisdom, and that’s how you get your heart ready to reach out at the Good News Cruise. Or at work. Or at school. Or at soccer. Or in the neighborhood. That means prayer, doesn’t it? We’ve been praying for the Good News Cruise. Every month at the Harvest Prayer Time. Every Wednesday night at the Prayer Meeting. And, I’m sure, lots of other places. Have you prayed for yourself and the Good News Cruise? That you would, in your heart, set apart Christ as Lord. Is there some area of your life that is not under the lordship of Christ? Some area that you’re holding back from Him? Set apart Christ as Lord IN YOUR HEARTS. In your innermost being. Set apart ALL of your hearts to the Lord. It’s not good enough to just set apart Christ in our hearts. We must also talk about Him with our mouths. People need to know the gospel. They need to know the good news of Jesus Christ. So somebody’s gotta tell them. V.15 again. This is like the Christian Boy Scout verse. Be prepared to serve someone a hot dog? Right? Always be prepared to park another car, right? So, what are you going to say if someone asks you? Everybody ought to have something ready to share. It doesn’t have to be long. In fact, it shouldn’t be long. If you are answer is a half an hour sermon, you’re doing it wrong. Have you ever heard of an elevator speech? They teach salesmen to give their presentation in the same time it takes to ride an elevator with someone you want to persuade. Now, we’re not selling anything. Including the gospel. But we can learn to give elevator-ride-length answers to Jesus questions. I’ll give you 1 minute. Answer the question, “What is this smooth route?” to the person next to you and then give them a chance to answer it to you. Now these instructions from the apostle Peter have a lot more to do with just being ready to speak out than they do to having a short speech prepared. Peter is not teaching that we have to have a sales pitch ready to go. But he is saying that we need to be ready to speak. When I was a student at Moody Bible Institute, they used to tell us that we needed to be ready to preach, pray, or die at moment’s notice. Two of those are easier than the others. The point is that people need Jesus and we need to be ready to talk about Him. Do you know who was good at that? Blair Murray was. He’s going to be missed this year at the Cruise-In. Keith Folmar has written a little tribute to Blair and to Lenny Mondock. Remember Lenny? He was always in the center of the fun at the Good New Cruise. He was the guy who was arranging for us to have all of those chips and stuff donated. You know, some of you might want to use that in your answer. I’m not going to tell you today how to answer the question. I’m not going to give you a little canned speech for you to deliver on Saturday. That’s not how it works in real life is it? If we have 120 of us here next week, we should have like 120 different answers. I’ve put a letter in each of the participant’s bags that explains the Smooth Route and quotes Proverbs 3:5&6. You could refer someone to that. Or you could quote it yourself and say what it means to you and how you’ve seen it work in your life. It’s going to be on each bottle of water. And you should have it memorized by now. You have hope. People are going to want to know where it comes from. That was especially true for Peter’s readers because they had hope even when things were going bad. And they were living their lives in such a way that people could tell there was something different about them. Do you have a painful hope? I mean hope through the tears? Back on September 11th during the terrorist attacks, author Jill Briscoe was on a plane to the United States that got re-directed to Greenland for two weeks. And everyone was miserable there. No one could go home, they had to sleep on military cots. And New York was in rubble. And Jill had a kind word, a shared blanket, and a smile for others, even when they gave her grief about it. She wrote when she got back that some of the people said, "What in the world do you have to smile about?" And she says, "So I told them!" Are you ready to tell people what you are smiling about? Maybe God is bringing pain into your life so that your hope shows through so that people ask. If you weren't hurting, they might miss your hope. But your hope is all you have when you hurt so God brings in pain to bring out your hope and make them ask. There is a right way and wrong way to do this. Look at verse 15 once again. It matters how we talk to people, not just what we say. That means don't shove it down their throats. Be tender with people. Warren Wiersbe reminds us that when we are doing evangelism, we are “witnesses not the prosecuting attorney” (Be Hopeful, 84). The purpose of explaining our hope is not winning an argument but winning souls to Christ and that can only be done with gentle winsomeness. Are you ready to do it that way? “With Respect” means not lording your knowledge over them, but handing it to them respectfully. You aren't a Christian because you are so great and they are so bad. You are a Christian because of the grace of God. Show that grace to them as you share your hope with them. And “With a Clear Conscience” means living the life that you are talking about on the inside as well as the outside. Not being a hypocrite. Walking the walk, not just talking the talk. Because they are watching your life to see if it matches your words. Do you trust in the Lord with all you heart? Do you lean not on your own understanding? Do you acknowledge Him in all your ways? They want to know that it’s for real. Not just some sales pitch. People are watching your life to see if it matches your words–not perfectly but truly. And if it does, Peter says, that someday (if only on the Judgement Day) they will be ashamed that they picked on you. Gentleness, Respect, a Clear Conscience. That’s the right manner to give out the gospel. We need to love the people we talk to. Even the ones that are against us. That’s what Jesus did. When WE were against Him. That’s the gospel. That’s the good news that this cruise is built on. It doesn’t have to be fancy. We just have to keep our focus on the main thing. And let’s go out there at the Cruise and in the rest of life and answer the question we’ve got on our backs.